"Always keep your bowler on in time of stress and watch out for diabolical masterminds." - Emma Peel to John Steed in "The Forget-Me-Knot". With an IQ of 152, Mrs. Peel was a mental match (as well as a physical match) for any opponent. Her beauty, prowess, wit, and charm made her one of the most desirable and formidable women of the 60's and early 70's. Few women since have had such a long lasting impact. Emma's apartment is a high rise in Highpoint, east of Hampstead Heath in London. 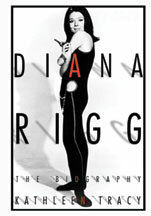 Follow the links to learn more about Mrs. Emma Peel or Dame Diana Rigg. Emma and other Avengers women with guns. 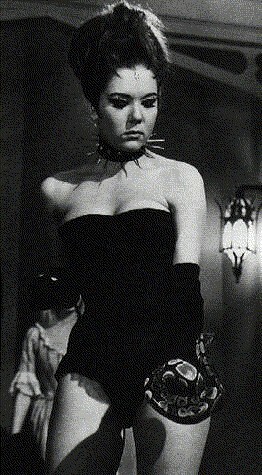 The Diana Rigg era. By Pete at the Gun Moll and Femme Fatale page. Emma colour sketch by Kim Whitesides that appeared in "Oui" magazine's (August 1973) interview with Diana Rigg. Emma in bed or red. Emma as Queen of Sin in black and white. 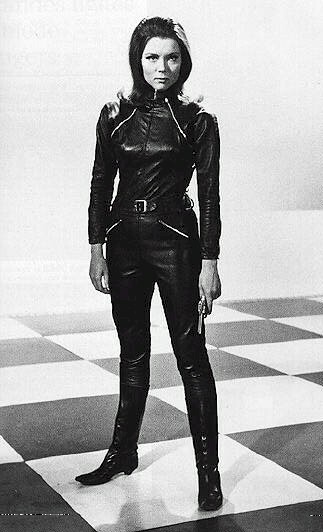 Emma in leather on the chessboard in black and white.